Raising our kids to be happy and healthy! Okay, so I feel like there is so much anxiety for moms around the schedule. Where each kid needs to be when, and how they are going to get there. It takes a ton of planning and a lot of remembering from the mom. 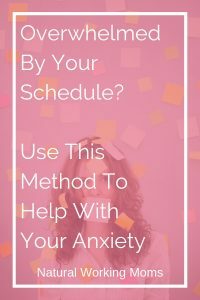 That is why I have created a weekly flow chart that will help anxious moms, not make them more anxious. What do I mean by that? Well, when I have a calendar or structured time blocks, this makes me feel more anxious and overwhelmed. Anyone else? It just makes me feel with anxiety when I look at that structure and I have so much to do that I am unsure about how to fill them, how long each thing is going to take, and I just start to have a panic attack! For a mom who has anxiety, a calendar with time blocks on it and all kinds of structure, is not going to work for me! Instead of helping me with my time, it just makes me freak out because to much stuff, too little amount of time. 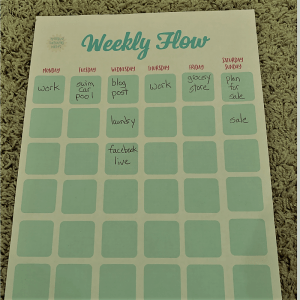 So this is where my weekly flow chart is the perfect calendar for me and all us anxious moms! It’s not that I don’t like to have a plan and a strategy, but the structure makes me real uneasy. You can get this weekly flow chart for free in the box above here! I think all moms are going to need this. So it is a weekly flow chart, which means all the days of the week are at the top. Then it has lots of spaces where you can write out all the things that you do on a weekly basis. Like I always do swim carpool on Tuesdays so I would write that in one of the squares on Tuesday. This way I will not forget that this is one thing I need to get done on Tuesday. Also, maybe you always go to the grocery store on Friday. Write grocery store on Friday. So you know that has to be done on Friday. I don’t write a time because, as I said, I don’t like the structure. And I don’t know how my day is going to go. 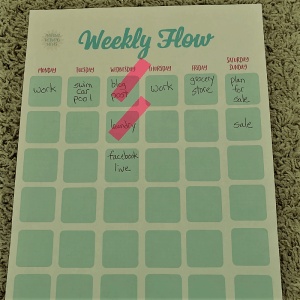 If you only work certain days, like I usually always work Thursdays, you can put that on the weekly flow calendar also. You can, off course, download it and type in your things before you print it if you wanted to! This is what the beginning of my weekly flow chart looks like. Now, what I do when I get something done is put a post-it note over it so I know a task is done for the day. 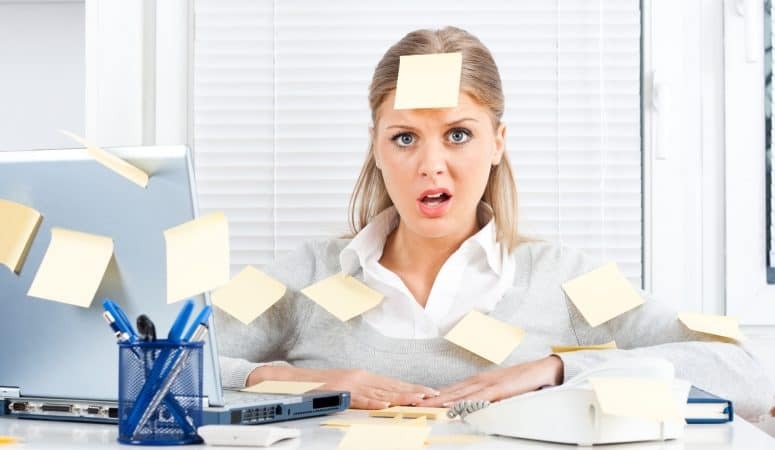 Then you can take the post-its off, put them at the bottom of the sheet and use them again for the next day. This way, you can use the same weekly flow chart over and over. Because I made this weekly flow chart for things that you do every week on a particular day, so you don’t want to write it over and over again. These are how I use post-it notes on my weekly flow chart. I left the flow chart pretty open so you can really turn it into anything that you want. If you have a business you run at home, and you always have a sale on Sunday night, put that down. If you always plan out your sale on Saturdays, put that down also. So you have no certain time you need to do things, just a certain day. This makes me so much calmer because I know what I need to do for the day, but no set time. This keeps my anxiety down. I think it will help you also. Because us anxious mamas are always looking for things to help us with our anxiety. Like lowering our expectations. And this weekly flow chart will help us be calmer for ourselves and our kiddos. Get a freebie that will help organize your life! Stressed Out Mom?? Get This Freebie to Help!